Coming at a list price of $645, you can easily find it under $500 on Amazon, which makes this purchase quite the deal. 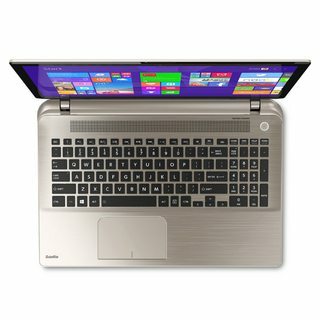 Powered by a 5th generation Intel Core i5-5200U processing unit, the laptop comes fitted with only 4GB of system memory installed, which Toshiba say isn’t user upgradeable. Bit of a downer there, but I’d say this minor inconvenience is counterbalanced by the new generation CPU, which is in our opinion the strongest quality the S55T-B5152 has. Storage capacity wise, the Toshiba has a 500GB Hard Disk installed. This is enough space for every day use, but can quickly become problematic if you tend to hoard movies or music on it. We’d say it’s enough for 90% of users, but should you need more speed you can always upgrade to a lightning-fast Solid State Drive or to a more spacious Hard Disk Drive. The screen has received some complaints by user saying they’ve received their units with dead pixels, but besides strictly isolated cases (caused most likely by faulty transportation) there have been no issues with it whatsoever. Good viewing angles and FHD resolution (1920 x 1080 pixels) make this display pretty great for its 15.6 inches screen. Furthermore, should you need more than FHD resolution you can also plug in an HDMI cable and enjoy movies or games up to 4K thanks to the 4K capable HDMI port. The screen is also a touchscreen device, though I imagine average users don’t use the feature that often. The real minus of this Toshiba is the lack of a dedicated video card. It comes with only an integrated Intel Mobile HD 5500 series card which will disappoint should you need to play recently launched games. The presence of harman/kardon speakers is a great add-on, not to mention the 802.11ac protocol Wi-Fi card. The battery pack gives enough juice for the laptop to operate for up to 6 and a half hours. Also, it’s surprisingly light for a 15.6″ chassis: only 4.5 pounds this thing weighs. Of course, it isn’t light enough to go backpacking around the world with it, but it’s enough for you to easily carry around to work or university. 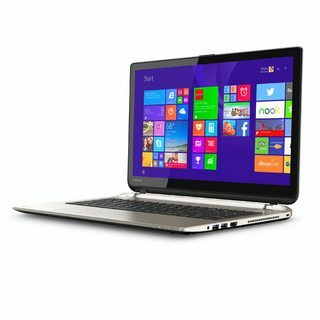 All in all, the Toshiba Satellite S55T-B5152 is a fairly potent all-rounder that will do its job for at least two or three years without ever feeling sluggish in this interval for the average everyday user.